Kilmarnock maintained their challenge at the top of this Befred Cup group with a two goal victory over Annan who remain routed at the bottom of the section and still looking for their first victory. 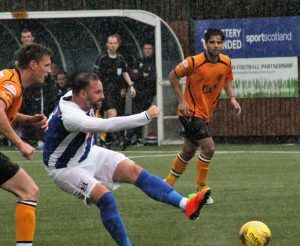 Kilmarnock secured the points thanks to their top striker Kris Boyd who scored a brace in a match played throughout in a deluge of rain which rarely ceased during the entire match. If ever there were a case made for plastic pitches then this was most definitely a strong case in favour and both sets of players deserve credit for serving up a very entertaining spectacle for the fans who turned out to brave the weather and a special word for the powers at be who gave permission for the Kilmarnock fans to take up a section of the covered terrace normally allocated for Annan fans to avoid the Kilmarnock fans getting drenched. Kilmarnock came out of the blocks and took the game to Annan and their early pressure rewarded them with the perfect platform in the 6th minute after the veteran striker Kris Boyd was at hand after Dom Thomas ended a penetrating run down the right finishing with a cross from the bye line and Boyd did what he does best to finish with a clinical shot past Jim Atkinson in the Annan goal. It was not the start that Annan would have planned and prepared for but to their credit they regrouped and made a real match of it and minutes later the home team forced a series of corners ending with the impressive Moxon’s effort being blocked by Boyd. At the other end Jones shot was blocked and Atkinson pulled off a comfortable save from Boyd . The Annan keeper was the busiest of the two keepers but Annan’s well organized defence made it difficult for the visitors to penetrate and there was no more scoring in a very entertaining first half. Annan made a promising start to the second half but scoring opportunities were curtailed by the Killie defence. McDonald was tested by Watson in the 60th minute but 2 minutes later Kilmarnock doubled their lead. Once again it was the talisman Kris Boyd who did the damage finishing with a superb curving shot past the diving Atkinson from 15 yards after some good work by Dom Thomas out on the right. The goal gave Kilmarnock the breathing space they required. The goal however did not dampen Annan’s resolve and they continued to play in a controlled manner shots from Stevenson and Moxon were blocked by Broadfoot who marshalled the Kilmarnock defence. Up front Aiden Smith was denied by a superb McDonald save in the 86th minute as the Annan striker looked to open his account and minutes later Smith fired in another good effort as Annan finished the match on the front foot. Kilmarnock manager Lee McCulloch was more than happy with the way his team went about their business, Kilmarnock played some excellent football moving the ball about impressively constantly trying to open the Annan defence and in Kris Boyd they had the match winner. Annan boss Peter Murphy praised his players for the manner in which they stuck to their task despite losing an early goal. The fans appreciated the way in which he has got them playing a controlled passing game. This competition is all about getting the players ready for the League Campaign and we are moving in the right direction. Clyde caused the biggest upset in the section defeating Championship side Dumbarton 2-1 a defeat which virtually leaves Annan and Dumbarton battling to avoid the wooden spoon. Annan travel to face Dumbarton on Tuesday evening and they finish their Betfred Cup matches next week at Galabank with the visit of Ayr United to Kilmarnock..
Annan – Jim Atkinson, Jack Brannan (Scott Hooper 70 min) ), James Creaney, Ryan Sinnamon, Peter Watson ( Raffi Krissian 76 min ), Steven Swinglehurst, Rabin Omar, Owen Moxon, Aiden Smith, Ryan Stevenson, Daniel Orsi. Subs not used Alistair Ferguson, Ayrton Sonkur, Kevin Rutkiewicz, Peter Murphy. Kilmarnock – Jamie McDonald, Greg Taylor, Kirk Broadfoot, Christopher Burke (Alex Samizadeh 76min), Rory McKenzie, Kris Boyd, Jordan Jones (William Graham 54 min), Domnic Thomas, Stephen O’Donnell, Iain Wilson, Adam Frizzell ( Alan Power 84 min). Substitutes not used Devlin Mackay, Daniel Higgins, Scott Boyd, Calum Waters.